This short guide will help you to ensure that you not only recover as quickly and easily as possible, but also that you maintain your motivation and drive to invest in whatever is next on your agenda, whatever it may be. The immediate post-race period is critical as, if you neglect your body, you can feel so bad that your motivation will take a big hit. The marathon will have left your hips and leg muscles extremely tight, so a long stretch targeting quads, glutes, hamstrings, calves and hips as soon as possible afterwards will offset the aftermath of hobbling and wincing. Your muscular glycogen stores will be very low and these need to be replenished first with some guilt free carbs. In general, try to steer towards more slow energy release foods like brown rice and quinoa rather than sugar and confectionery, but immediately post-race, in the battle to replenish glycogen stores, even these won’t do any harm! You will also need lots of protein to repair the muscle tissue broken down in the race, plenty of water to replenish fluids and loads of greens and healthy fats to reduce inflammation and boost recovery. Finally get a good night’s rest that first night; it’s the most important one for healing and do resist the temptation to have alcohol and a takeaway; it may seem appealing after the training but you will suffer for it. Take a few days off to thoroughly rest. Your body will be exhausted and you may well have toe nails to grow back and chaffing to soothe. A daily walk is always a great aid for recovery but perhaps leave it at that for a week or so. Keep fuelling your body with plenty of protein, veg and healthy fats. After 7 days or so go to a yoga class or have a swim to ensure you don’t lose the exercise habit. It’s far easier to stay motivated with a clear goal in mind, so set yourself a challenge straight away. Perhaps not as tough as a marathon initially, but enough to keep you driven while you think about the next big challenge. You could make it fun by doing a charity event with the added motivation of helping others. Perhaps a hiking or other activity break a few weeks post marathon will help you stay motivated. You may think you never want to run again until you get outside and active again. Statistically people who work out together stick at it for longer than those who go solo, so find a friend to workout with. There are also free organised park runs all over the country, so you can join in with a group and spur each other on if motivation does start to wane. Your regular running plan will no longer be needed and a change may be just what you need. Try a new activity like boxing or a military style bootcamp, or even a team sport with a good social side. Staying active between training sessions is always key to maintaining fitness. Perhaps buy a little health gadget such as the latest Wearable technology like a Jawbone or Fitbit. The daily activity, sleep and food tracking is quite addictive and great for boosting motivation. You can even set up a team to compete with your friends if you are driven by a bit of friendly competition. In times when motivation is tough, think about how lucky you are to be able to exercise at all and how you would feel if exercise was no longer an option. It’s an old adage, but it’s true that we don’t always realise what we’ve got until it’s gone. Enjoy it now and think about those who would love to be able to exercise but cannot. You’ve done amazingly well and that should not go unrecognised. But rather than treating yourself to something highly indulgent or bad for you, treat yourself to something fitness related like a new workout outfit or pair of trainers. Seeing your lovely new gear in the wardrobe ready to be worn will help to kickstart motivation and get you out there exercising again. People often shy away from celebrating how great they look as a result of exercising. The chances are that you are in the best shape you’ve been in for a while, if not ever. Celebrate this by capturing how good you look with a professional photo shoot or, if that’s really not for you, have an evening out in an outfit you feel great in. Maybe it’s one you’ve had in the wardrobe for years and haven’t dared to try on let alone wear, or it could be one you’ve had your eye on for a while and haven’t bought as you didn’t feel confident enough to wear it. You’ve just run a marathon, you are definitely worthy of a more daring outfit! 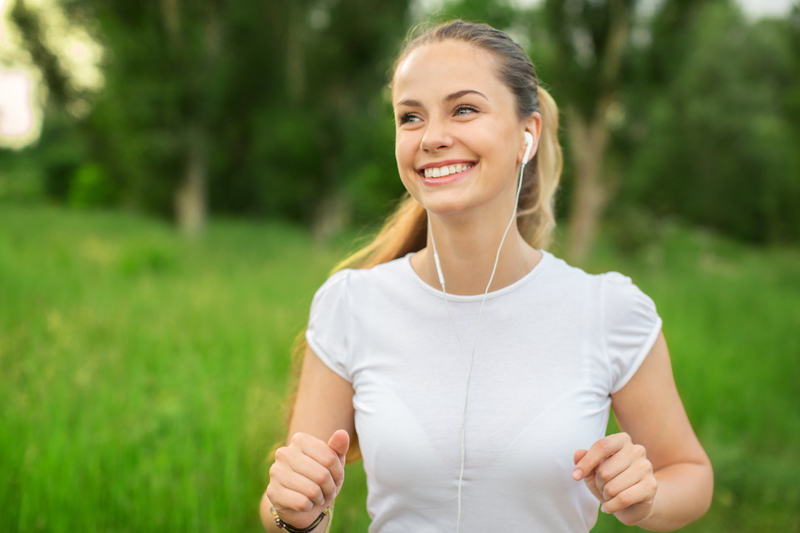 You probably already have a motivating playlist that has helped get you through many a tough run. But if you’re finding even that isn’t cutting it, try downloading a really great audio book. Getting to a really gripping part of a thriller, autobiography or even a motivational book itself, can mean carrying on exercising for that bit longer when you may previously have given up. This should serve as a reminder as you how great you feel when you do get out there and start moving. Most importantly now, have a great day and enjoy the experience!